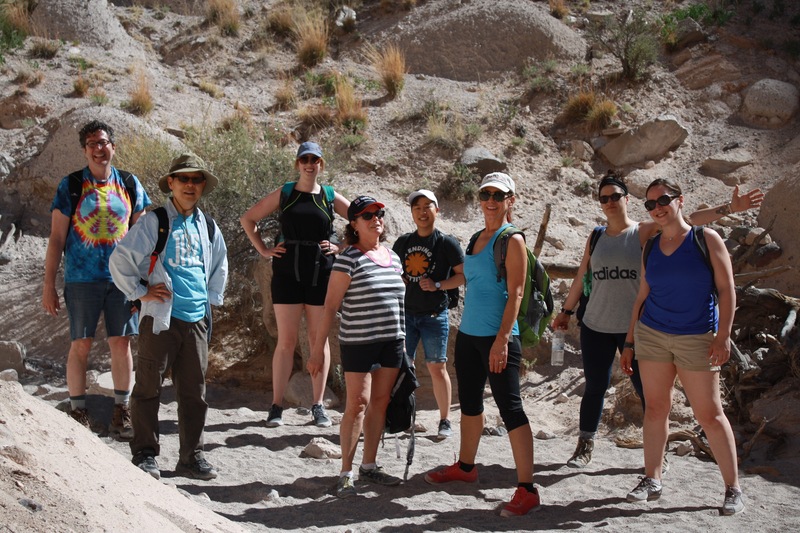 This spring, the college’s Gracenotes Volunteer Committee sponsored its second annual trip to New Mexico. A group of nine staff and faculty members traveled to Santa Fe to work with Habitat for Humanity. Here, one of the trip participants, Jeannie Gagné, shares her experience. I hadn’t been to Santa Fe since I was a kid, but I still remember the desert landscape, playing with a little redheaded friend in her dusty backyard filled with palm trees, and how beautiful it was. Iguanas. Snakes (cool!). Bugs. Heat. Brown earth, no grass (weird!). When we arrived in Santa Fe for Gracenotes, I didn’t see a neighborhood resembling my memory. Instead, our simple hotel’s inner courtyard was bursting with fragrant pink rose bushes and boasted a clean but chilly pool. Home for a week. Perfect. 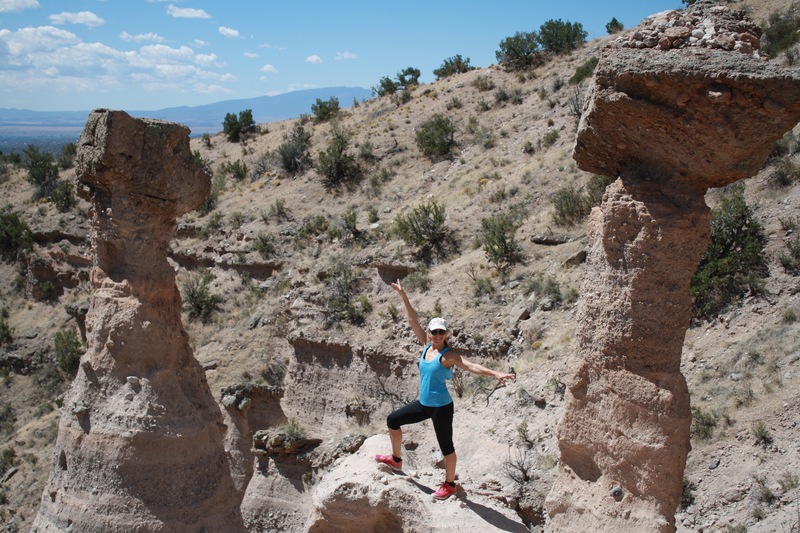 The first day we took an amazing hike through Kasha-Katuwe Tent Rocks National Monument. Wow! I loved every second of it. The formations are extraordinary, and the hike was vigorous enough to be a great team building day for all of us. We became fast friends! That is rare and wonderful. Arriving Wednesday at the Habitat site we were greeted by the Americorp volunteers Cal and Alexander with fun enthusiasm for our volunteer group. We got to working right away, after a lesson on how to use the equipment safely. During the week we worked on three homes with a variety of projects, met two of the homeowners, and used a myriad of tools (I was especially psyched to finally learn how to use the cordless circular saw my spouse has been promising to show me!). I was also excited to see Habitat’s homemade dirt screen that separates out small rocks from the soil, and I’ve already begun to build one for our rocky soil back home. It was dry, dusty, and hot. Did I say it was dry? Very. But it didn’t matter. Oh yeah, it was my birthday while on the trip. Coincidentally our fearless leader Ellen had planned a field trip on my actual birthday. We went to this crazy fun art experience called Meow Wolf. I decided it was my birthday party! Our group all worked hard all week, and joyfully, and collaboratively. Our young Americorp teachers were patient and fun. They said we were among the most productive group of volunteers. Proud! This trip was amazing. Thank you, Berklee. Jeannie Gagné M.A. has been a professor of voice at Berklee since 2000; is the author of two Berklee Press books on singing; and is a performer, recording artist, and songwriter. Her popular YouTube channel TheVocalGenie offers fun, mini voice lessons, and she travels regularly to teach and perform. When not doing music, she is an avid gardener and likes to make stuff.